Mark Kilpatrick, Forbes 30 Under 30 award winner makes his home in Manhattan Park. Mark Kilpatrick shares a home in Manhattan Park with his wife of just over a year and two of the mellowest cats you're likely to meet. 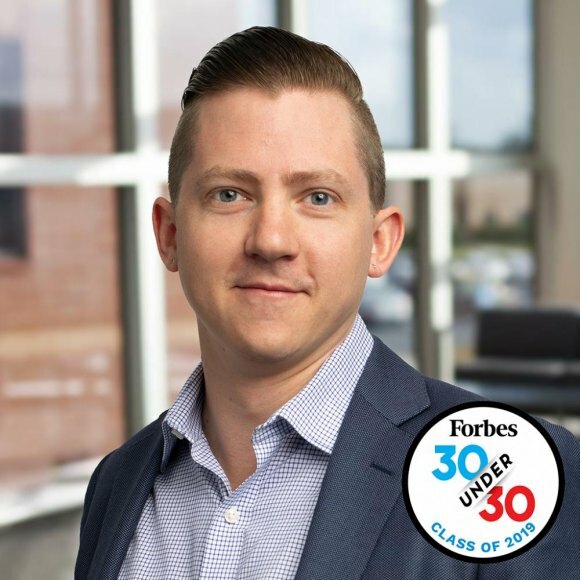 Urban FT Group, Inc., a leading core FinTech provider and industry pioneer, recognizes today that Mark Kilpatrick, its Chief Product Officer has been awarded a place on the esteemed Forbes 30 Under 30 list. Fueled by passion and a lust for innovation, Mark has taken a radical, renegade-style approach to product development - which has sparked the success of a FinTech company that empowers the growth of small to midsize Financial Institutions (FIs) and the inspiring communities that they serve. This is clearly not only a huge personal win for Mark, but is proof of the incredible things we are doing for the clients we serve. It also exemplifies the effort of an amazing talent pool here at Urban FT.
Mark is considered a trailblazer in the Financial Services Industry by delivering enterprise solutions that empower the “underdogs.” He has hit “reset” on the way FIs engage with end-users. Once a “small town kid,” he opened his first checking account at Riverview Community Bank in Stevenson, Washington - a town of approximately 1,200 residents. Mark recognized early on the role that the “little guy” plays within the broader Financial Services Industry as well as their communities. Little did he know that years later this moment in his life would be one of the most defining of his career - so far. Just weeks before winning the Forbes 30 Under 30 award, Barry University also selected Mark as a 2019 Distinguished Alumni. The skills he learned studying graphic design at Barry equipped him with the ability to craft insightful and inspiring images, stories, and interfaces, which he injects into the design, build and run approach that Urban FT takes with product development. This framework has delivered Urban FT’s clients with service, functionality, and user experiences that not only compete with but in most cases transcend those offered by larger, more dominant institutions. Urban FT has positioned itself as revolutionary pioneer, making sh*t possible by building up organizations that truly care about their communities by driving them away from the status quo. A passionate advocate for the underdog - Urban FT provides a digital banking platform to over 700+ clients, the majority of which are community banks and credit unions that account for 10% of the U.S.- based market, $20B or less in assets. Recognized as one of the most progressive and successful FinTech companies in the Financial Services Industry today, Urban FT empowers clients with service, functionality, and UX that not only competes with but in most cases - transcends those offered by the larger, more dominant institutions. Since inception in 2012, the company has grown to +$3B in annualized processing volume.